The Kaheawa Wind Farm-with its 20 turbines-is at an elevation of 1,900 feet, in the West Maui Mountains. The recently completed Kaheawa Wind Farm project in Hawaii--the largest wind farm in the state--faced its own special set of environmental challenges since it was built on State Conservation Land. Just about every wind farm project has its own set of regulatory hurdles to contend with, but the recently completed 30 MW Kaheawa Wind Farm on Maui in Hawaii was perhaps unique in that the project was built on State Conservation Land and, as a result, came with its own special package of challenges. It meant more government agencies to deal with--including agencies overseeing wildlife issues. That considered, it's perhaps not surprising that the wind farm's first employee was not on the operations side--but in fact a wildlife biologist. "The approval and regulatory environment is strict to start with in Hawaii," says Mike Gresham, vice-president of Kaheawa Wind Power, which is jointly owned by UPC Wind Partners, LLC of Newton, Massachusetts, and Maui-based development company Makani Nui Associates, LLC. "Building the wind farm on State Conservation Land on Maui complicated things quite a lot. "But you could also say that the state is accommodating in that Governor Linda Lingle has really been supporting renewable energy, of all types and kinds, in the state." The state of Hawaii has a Renewable Portfolio Standard (RPS) goal of achieving 20 percent by 2020. Currently, about nine per cent of the state's energy is achieved with renewable resources, including power from the new Kaheawa Wind Farm, the largest wind farm in the state. It started generating power into the grid in June 2006. Most of the state's power is now generated using imported oil, which--with the often turbulent international oil markets--is a further incentive in the move to renewable energy. "We are highly dependent on fossil fuels in Hawaii, and vulnerable because we are 2,400 miles away from the nearest continent and thousands of miles away from the source of those fossil fuels," notes Gresham. He terms the new wind farm a step in the right direction--and it has received a great deal of support in the state. The 200-acre site on State Conservation Land proved to be, hands down, the best site for the wind farm. "We were very fortunate to have access to the land," says Gresham. And also fortunate in that Hawaii has a statute that allows renewable energy projects on conservation land. 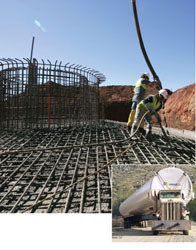 The Kaheawa Wind Farm project involved a range of construction challenges, from its high elevation site to the 4.5 mile access road (above, inset), with turn radiuses of a minimum 200 feet to accommodate long tower loads. The most difficult part of the project proved to be the permitting and entitlement work required for the various approvals, says Gresham. "At any given time, we did not know if we were going to get to the goal line or not. We did not know if the agency we were working with might be that one agency that would not be satisfied from a permitting standpoint. "Even though we had a lot of support from the state government, there were still a lot of separate agencies--state and federal--to deal with. In the end, it does not matter how excited the state is about renewable energy; if you can't satisfy all the agencies involved, it's not going to work. "The construction side of the project was challenging and interesting--but our guys never doubted that they could do it. In the permitting phase, though, we went into crisis mode at times, knowing we needed a yes from an agency, and that without that approval, the project would not go ahead." Getting, and keeping, community support was also crucial. "If a small group decides the area where you want to operate has some kind of historical significance, you're going to have a heck of a time getting past that," says Gresham. "The Hawaiian community likes wind and renewable energy--but they are also big supporters of Hawaiian culture." Interestingly, the project, under several companies--including at various points General Electric and Enron Corp.--had been in the planning stages since 1996. It underwent extensive review over the subsequent years, and a state approved final Environmental Impact Statement (EIS) was in place. Some initial work had been completed, including wind measurements with meteorological towers. "But there were still other reviews and approvals to be gained," explains Gresham. "The real value-add that UPC Wind Partners brought was the necessary industry knowledge, the development funds and--if there was a central ingredient--it was the will on the part of the partners to complete the project because in the end having that will is what it took to get it done." The wind farm's development and operation plans call for extensive protection of the fauna and flora, and the inclusion of a Habitat Conservation Plan (HCP), said to be the first ever for a wind energy project in the United States. The EIS stated that there were four federally listed endangered species--including the Nene, the official state bird of Hawaii--that had to be considered in construction of the project, hence the need for an HCP. There was concern that the project might have an impact on the nesting activities, and there might be bird collisions with the turbines. The company undertook a great deal of avian studies, utilizing the services of that first wildlife biologist employee (they have since added an additional wildlife biologist). "We've had zero bird incidents during construction and in operations so far," says Gresham. "That's a welcome relief, but we had some early indications that the birds could recognize what we were doing while we were putting the towers up, and that they would avoid them. "Since then, the biologists have actually taken pictures of Nene birds flying in formation, going through the turning rotors, which indicates the birds can see and avoid the obstacle." Each construction day on the wind farm site started in an interesting way. A wildlife biologist would first have to survey the access road construction area for Nene birds that might be in the area, post signage about Nene activity, and then come back and brief the construction crew. After that, they could start work. There seemed to be challenges to deal with on an ongoing basis with Kaheawa, says Gresham. "It was that kind of a project--it seemed every way you turned there were unique things required that weren't impossible, but they added to the cost." These challenges also added to the complexity of the project, and made planning that much more important for the project to be a success. Not that there was any doubt before, but the successful completion--and operation--of the Kaheawa project has driven home the tremendous potential for wind power in Hawaii. Part of the difficulty in harnessing that power lies in the fact that the state of Hawaii is made up of a series of islands. "We certainly saw the potential with the Kaheawa project, and still think that is the case, but you have to deal with two overriding issues: siting and the small island grids,"explains Gresham. Hawaii's various islands are not connected in any kind of overall grid, which prevents the transfer of power between the islands. And any wind power that could be generated might not be required by the island that has the best sites. For example, there are good sites on the island of Hawaii, but the population is relatively small and power demand is relatively low. The island of Oahu, on the other hand, has the bulk of the population, but lacks the land mass to support a large wind farm project. "There are some macro issues that really limit the wind energy opportunities in Hawaii," notes Gresham. Undersea power cables, to connect the islands, have been looked at, but have been ruled out so far as being cost prohibitive. There are also issues with integrating wind energy into the grid. In the case of Maui, the peak load is approximately 200 MW in the summer, but off peak that drops to about 85 MW. "So with our Kaheawa project, when we are putting 30 MW into an 85 MW grid, and if the wind dissipates quickly, the utility has to bring up a lot of generation very fast," explains Gresham. The oil-fired generating capacity has to be managed carefully to make best use of the wind energy, and to make sure there is not any lag in power generation when there is a reduction in wind power. That said, the Kaheawa site is very robust, Gresham notes. They have experienced gusts of up to 60 to 65 mph so far (the system shuts down at 55 mph). Power from the Kaheawa Wind Farm was crucial in getting the Maui power system back up this past October, when the islands were hit by an earthquake measuring 6.7 on the Richter scale, which resulted in power outages. "The Maui Electric Company utilized us to help keep the grid energized," says Gresham. "They wanted us to give them power in increments of 5 MW and we were able to do that. It was an important part of getting the utility up on the island. They were back up in about fours hours, but on Oahu they were shut down all day." Since its start-up last year, the wind farm has been on the receiving end of a great deal of praise, and support. A sail past the wind farm is even included in some local boat tours. Kaheawa's owners have gone through the regulatory gauntlet with this project, and perhaps now have a template for further wind projects. The question is whether these projects will get the go-ahead. "We have a couple of potential sites, but it is very slow going," says Gresham. "I honestly don't know if Hawaii will see much more wind energy." Gresham suggests it would help if the state got on board in a bigger way, perhaps issuing an RFP for wind power, and setting aside land that offers a good wind resource, and nearby transmission facilities. "From there, the companies involved in wind power could bid on it." With conventional energy prices going through the roof, and the push on for green power, momentum is truly behind wind energy, along with other types of renewable energy. "I think we're in the early stages of people waking up to the need for renewable energy, and not just in Hawaii," notes Gresham. The private sector has an important role to play in developing these new sources of energy and is willing to take on the risks involved. But some creative, thinking-out-of-the-box approaches on the part of government and utilities could help spur renewable energy development, Gresham believes. "Government has provided some good incentives, but it probably needs to provide some more incentives, and perhaps even some disincentives for new coal power plants or the other fossil fuel-based energy sources that we as a nation need to move away from." 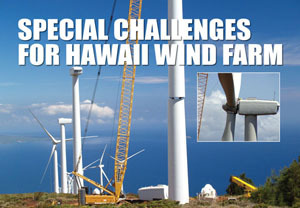 The Kaheawa Wind Farm project in Hawaii did present some unusual challenges from a construction perspective. For example, Hawaii does not have a large industrial infrastructure nor a big port system. The port in Maui only handles containers, meaning the tower sections, which were shipped from Korea, had to be offloaded using 300 ton shipboard cranes. The wind farm site is located above McGregor Point, at an elevation of 1,900 feet, in the West Maui Mountains, in an area locally referred to as Kaheawa Pastures. "Things started at sea level, where we had a small staging area, and from there it was a 15 percent grade all the way up to the project site," explains Mike Gresham, vice-president of Kaheawa Wind Power. "So the road is pretty steep in places--and where it is not the maximum steepness, it's climbing the whole time. Taking the heavy loads, the tower sections and the cell, up the mountain required some pretty specialized vehicles and some creative thinking." The 4.5-mile access road--which had as its base an existing, but seriously challenging four-wheel drive trail--was designed with a steady vertical grade, but also took into account the long tower loads. The turn radiuses had to be 200 feet minimum. The initial transportation solution was Oshkosh M911 military surplus vehicles to tow the trailers. The Oshkosh vehicles are usually used to tow M1 tanks off battlefields. They pack plenty of punch, being 10-wheel drive and equipped with a Detroit 8V-92TA, 450 horsepower engine. "They are very robust, but they still broke down frequently trying to get those very heavy loads up the hill," says Gresham. They added 1,500 pounds of weight to the front of the Oshkoshes, to help keep the front wheels from hopping, and for the heaviest loads, they put a Caterpillar D-9 dozer in front, to pull in tandem. "So we had the Oshkosh itself which weighed 40,000 pounds, a 30,000-pound trailer, and then a 115,000-pound load--we had just under 200,000 pounds being pulled up a 15 percent grade." Up at the top of that road, they built a facility that consists of 20 wind turbines arranged in a single row, an operations and maintenance building, a communications system, an electrical substation, and an interconnection to Maui Electric Company's transmission lines. The project was built using as many local contractors as possible. Rojac, Inc. was one of the lead contractors for civil work. M.A. Mortensen (of Minnesota) provided the civil supervision and turbine erection. General Electric supplied the wind turbine generators and ABB, the project's electrical contractor, supplied the electrical gear and construction services using Manua Kea Electric.